If Rip Van Winkle awoke from a 99-year nap he would discover a world that had vastly changed in all areas except one: education. A lone teacher imparting academic lessons to a classroom of students remains the familiar, comfortable model that has persisted for generations. But is it still effective? Citizen Schools deploys AmeriCorps members and volunteer “Citizen Teachers” to teach extended-day middle school classes in engineering, law, business, the arts and more. The program operates in 12 mostly lower-income school districts across seven states. The current era of “unprecedented inequality” poses the greatest challenge to closing the achievement gap in schools, Schwarz said, citing standardized test scores that show children from lower income households are two years behind in skill level to children from higher income households and earn college degrees at an 8 percent rate compared to 80 percent for high-income children. “The dialogue about education is so broken; there are different camps and a deep distrust among them,” Schwarz said. The American public education system has been made a convenient scapegoat, he said, though public education in many other countries is remarkably successful. Allowing public education to be shaped by market forces, or ridding schools of standardized testing, are not the answers, he said. At the core of the widening gap is what Schwarz describes as the “shadow education system” — the opportunities outside of school, such as preschool, enrichment activities, family trips, coaching and tutoring, that are available to children of higher economic standing. Upper income families invest nine times more than lower income families on everything from SAT preparation to robotics camps to violin lessons — activities that help them build “the muscle memory of success,” he said. Schwarz noted that the gap is not only reflected in academics but also in jobs and internships, where those in higher income brackets have access to more opportunities thanks to family connections. “If we wait for [U.S. Secretary of Education] Arne Duncan, if we wait for [Massachusetts Governor-elect] Charlie Baker, if we wait for the Worcester superintendent of schools, if we wait for school principals to be the leaders in narrowing the achievement gap in the country, the state, the community, we’ll be waiting a long time,” he said. By expanding the learning day by three hours and bringing in community members to oversee apprenticeships in everything from carpentry to rocketry to video game creation (students take four apprenticeships in a school year), Citizen Schools are providing students in low-performing schools a formalized brand of the shadow education available to others in economically advantaged areas. This enrichment motivates students to care about school, allows them to learn in different ways, and boosts their self-confidence and social skills, he said. During the question-and-answer session, Schwarz acknowledged that good parenting is crucial to children’s academic development. He said parents in low-income households — rather than the “ogres” they’re often depicted as — harbor dreams of academic and professional success for their children and are more eager to participate in that process than they are typically given credit for. Simple measures such as having teachers regularly call parents to report on positive progress and announcing school events through flyers written in the language of non-English speakers can be critical to nurturing more parental interest, he said. 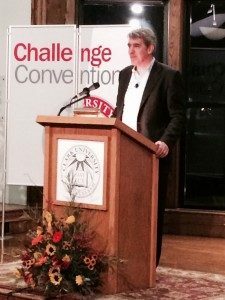 Schwarz said he was excited to learn about Clark University’s LEEP model for education because it takes an “uncommonly serious” approach to experiential learning. He said he’s looking at incorporating similar LEEP-like themes into Citizen Schools.